The effect of the holy Spirit at the first Pentecost was to make unity – the incident of people understanding different languages should not be taken literally, but that some deep divisions among people can be overcome by the Spirit of God. Many of the gifts of the Spirit in the second reading (Galatians 5:16-25) are about a deep unity among us – trusting, love, patience. These and other gifts of the Spirit bring unity at a deep level in families, friendships, all kinds of relationships and communities . The effects of disunity can lead in the end to murders, violence and wars. No wonder Jesus prayed so often for unity, and his Spirit would unite us. Disagreements may happen in the best of relationships, and lead often to peace in the end. Dividedness never leads to peace and is never from God. Another unity of Pentecost was the reconciliation between Jesus’ natural family and the family of the apostles. Another gospel account says that In the upper room were people like James, his family ‘brother’, and Mary his mother, the uniting love of all Jesus’ followers. May your kingdom come and you will be done. 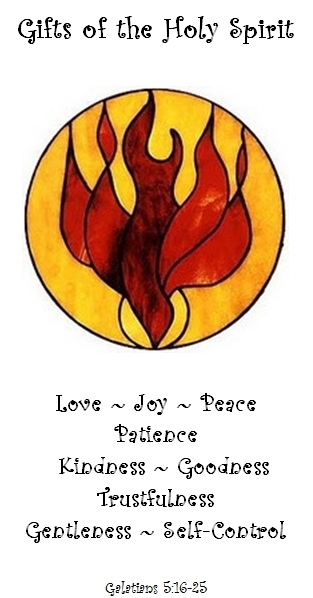 This entry was posted in Gospel of John, Gospel Reflection, Liturgy Resources, Prayer Resources, Scripture, Year B and tagged Christ, Donal Neary SJ, Forgiveness, Gifts of the Spirit, Gospel Reflection, Holy Spirit, Jesus, Love, Peace, Pentecost, Pentecost Year B, Spirit, Unity.